Nothing more than Apple’s renowned system font ”Geneva“ in the bit map representation, but as a PostScript font; aliased like ”Geneva“ in 9 or 10 points, or even in resolutions that are too small, that is, under 8 points; ideal for ”pixely“ topics. An anachronism in the digital age: While the whole world speaks of progress, the font on the monitor has only ”progressed“ into a non-pleasant-to-read conglomeration of pixels. Each object on a monitor is displayed by lining up individual pixels. These pixels are so tiny, that they are hardly perceivable. The more pixels per surface unit (that means, the higher the resolution), the more the picture perceived by the eye merges into a sharply defined unit. 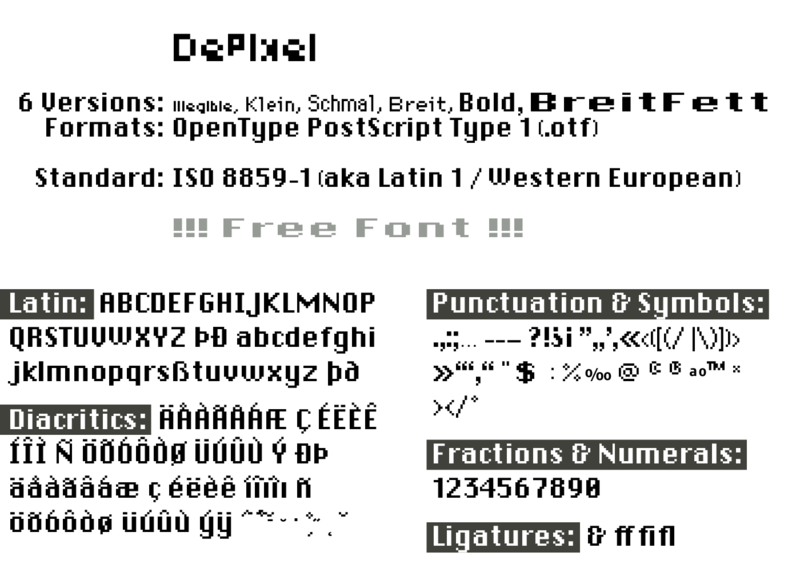 DEPIXEL is based on the monitor fonts ”Geneva“ and ”Chicago,“ developed by Apple Computer. It simulates the configuration of individual pixels into letters. Thus, a font emerged which, regardless of size, can be recognized by the composition of a few individual pixels. ILLEGIBLE DEPIXEL came about as a result of exaggerating the pixel effect. As with the other versions, it is composed of individual pixels. But here the cap height only amounts to 5 pixels and the x-height merely 4 pixels. Furthermore, this typeface shows the well-known effect from the Web of a font design which is too small and makes text appear almost illegible. 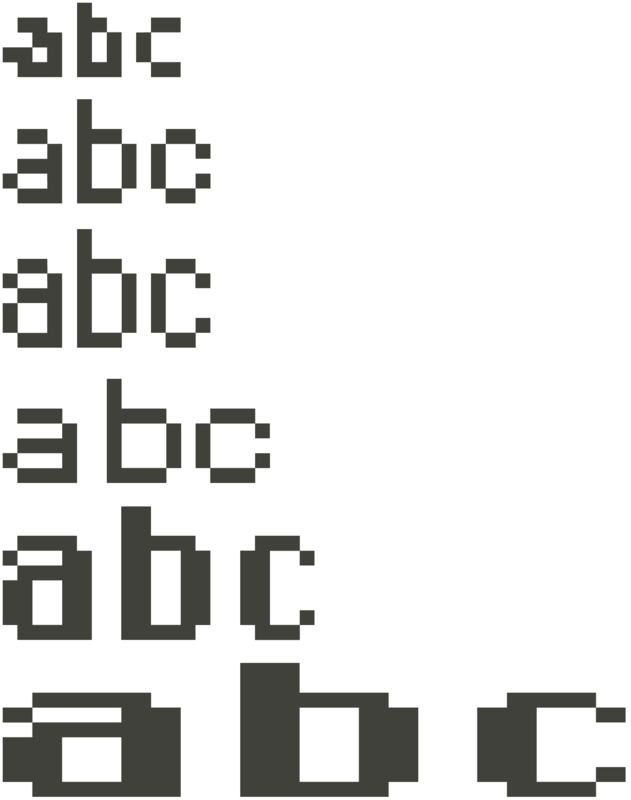 ILLEGIBLE DEPIXEL is not really illegible; its forms were "destroyed" deliberately. In comparison, a good legible alphabet must be at least 9 pixels high: 5 pixels for the mean height and 2 pixels each for the extenders. With its proportions, DEPIXEL KLEIN (small) meets these requirements. DEPIXEL SCHMAL (thin) stretches out to 6 pixels on the main line whereas the upper and base overhang amount to 2 pixels. 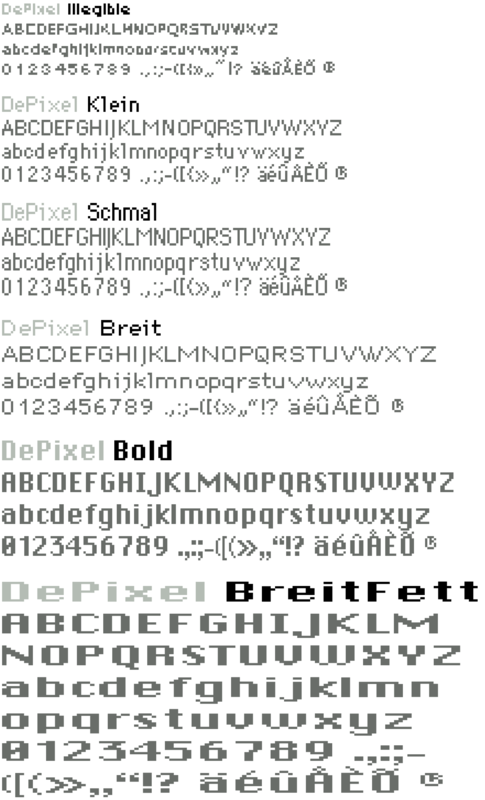 DEPIXEL BREIT (expanded) was developed by expanding the letters by one pixel. In contrast to the ”normal“ versions, the basis for further versions was Apple’s ”Chicago“ font. By means of doubling the width of the stems, an obviously bolder and larger font was created using the same basic pixel size. DEPIXEL BREITFETT (wide and bold) is nothing more than the bold font expanded to double width.